Hollow Knight is a Metroidvania video game developed and published by Team Cherry. The game was released for Microsoft Windows, macOS, and Linux in 2017, and for the Nintendo Switch, PlayStation 4, Xbox One in 2018. Development was partially funded through a Kickstarter crowdfunding campaign, raising over A$57,000 by the end of 2014. 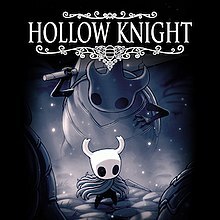 The game tells the story of a knight on a quest to uncover the secrets of the long-abandoned insect kingdom of Hallownest, whose haunting depths draw in the adventurous and brave with promises of treasures and answers to ancient mysteries. A sequel to the game, Hollow Knight: Silksong, is currently in development and is set to release on Microsoft Windows, Mac, Linux and Nintendo Switch, with Team Cherry stating that "more platforms may happen in the future." Team Cherry had previously planned this game as a piece of downloadable content. Kickstarter backers of Hollow Knight will also receive Silksong for free when it releases. The player character fights the boss enemy False Knight. In the top-left corner appears the full Soul Vessel. To its right, on top, there is only one Ancient Mask (health) remaining. Below, the amount of Geo currency is shown. Hollow Knight is a 2D Metroidvania action-adventure game, which takes place in Hallownest, a fictional ancient kingdom. The player controls an insect-like, silent, and nameless knight while exploring the underground world. The knight wields a nail, which is a cone-shaped sword, used both in combat and environmental interaction. In most areas of the game the player encounters hostile bugs and other sorts of creatures. Melee combat involves using the nail to strike enemies from a short distance. The player can also learn spells, allowing for long-range attacks. Defeated enemies drop currency called Geo. The knight starts with a limited number of masks, which represent hit points of the character. "Mask shards" can be collected throughout the game to increase the player's health. When the knight takes damage from an enemy or from the environment, a mask is deducted. By striking enemies, the knight gains Soul, which is stored in the Soul Vessel. If all masks are lost, the knight dies and a Shade appears at that place. The player also loses all Geo and can hold a reduced amount of Soul. The player needs to defeat the Shade to recover the lost currency and to carry normal amount of Soul. The game continues from a last visited bench—they are scattered throughout the game world and act as save points. Initially the player can only use Soul to "Focus" (regenerate masks), but as the game progresses the player unlocks several offensive spells, which consume Soul. Many areas feature more challenging enemies (bosses) which the player may need to defeat in order to progress further. Defeating some bosses grants the player new abilities. Later in the game, the player acquires a "dream nail", a legendary blade that can "cut through the veil between dreams and waking". It enables the player to face more challenging versions of some bosses, and to break what is sealing the path to the final boss. During the game, the player encounters non-player characters, with whom they can interact. These characters provide information about the game's plot or lore, offer aid, and sell items or services. The player can upgrade the knight's nail to deal more damage or find soul vessels to carry more Soul. During the course of the game, the player acquires items that provide new movement abilities. They include an additional jump mid-air (Monarch Wings), adhering to walls and jumping off them (Mantis Claw), and a quick dash (Mothwing Cloak). The player can also learn other combat abilities, known as nail arts, and the aforementioned spells. To further customise the knight, the player can equip various Charms, which can be found or purchased from NPCs. Some of their effects include: improved combat abilities or skills, more masks or their regeneration, better movement skills, easier collecting of currency or of Soul, and transformation. Equipping a Charm takes up a certain number of limited slots, called notches. Wearing a Charm that requires more than the available number of notches is possible, but it results in being "overcharmed", causing the knight to receive double damage from all sources. Hallownest consists of several large, inter-connected areas with unique themes. Although Hollow Knight does not bind the player to one path through the game nor require them to explore the whole world, there are obstacles that limit the player's access to an area. The player may need to progress in the story of the game, or acquire a specific movement ability, skill or item to progress further. To fast travel through the game's world, the player can utilise Stag Stations, terminals of a network of tunnels; the player can only travel to previously visited and unlocked stations. Other fast travel methods, trams and "Dreamgate", are encountered later in the game. As the player enters a new area, they do not have access to the map of the surroundings. They need to find Cornifer, the Cartographer, in order to buy a rough map. As the player explores an area, the map becomes more accurate and complete, although it is updated only when sitting on a bench. The player will need to buy specific items to complete maps, to see points of interest, and to place markers. The knight's position on the map can only be seen if the player is carrying a specific Charm. Prior to the start of the game, a creature known as a Wyrm dies near Hallownest, but later appears as a being known as the Pale King. The bugs of Hallownest at this time worshiped a being known as the Radiance, but the Pale King is able to convince the bugs of Hallownest to forget the Radiance and accept him as the ruler of Hallownest. The Pale King then goes on to construct a great kingdom. However, after some time, bugs began hearing the whispers of the Radiance in their dreams, and this soon led to an infection of madness and mindlessness that affected many of the bugs of Hallownest. In order to combat this, the Pale King attempted to contain the infection within a single Vessel, shadowy beings created by the Pale King. This Vessel was then contained within the Black Egg Temple and sealed by three powerful bugs known as the Dreamers. At the game's outset, the player character, the Knight, arrives in Dirtmouth, a small town above Hallownest's ruins, seeking to venture within. As they journey through the forgotten kingdom, the Knight encounters the possessed remnants of Hallownest's former residents and other creatures, who are slowly being overcome by a mysterious Infection. They also encounter Hornet, the self-proclaimed protector of Hallownest's ruins, who attempts to stop the Knight's quest on multiple occasions. Through learning the history of Hallownest on their journey, the Knight discovers that they are a failed Vessel, one of many artificial beings created by the Pale King to stop the Infection by sealing it away within them. It also becomes clear that the Pale King's attempt at sealing away the infection using the Vessel known as the Hollow Knight did not work and would soon completely fail, allowing the infection to consume all the remaining inhabitants of Hallownest. Depending on the player's actions, Hollow Knight has multiple endings. In the first ending, the player Knight defeats the Hollow Knight and absorbs the Infection into itself to become the new Vessel. As chains manifest to hold the Knight in place, the Temple is once again resealed and the plague is held at bay, though its true source still survives. The second ending occurs if the player is able to collect an item called the Void Heart before fighting the Hollow Knight. Halfway through the battle, Hornet arrives to offer assistance and briefly holds the Hollow Knight at bay. Choosing to continue fighting normally causes her to be knocked unconscious. The ending then plays out like the first, except Hornet is sealed in with the player Knight and her mask is used as the new Dreamer seal upon the Temple door. The third ending occurs if the player Knight collects the Void Heart and uses the Awakened Dream Nail ability to enter the Hollow Knight's mind when Hornet arrives to help. Here, the player Knight challenges The Radiance, a moth-like goddess who was the true source of the Infection and who sought to return to power in Hallownest and eliminate the Pale King's influence. With the power of the Void Heart, the player Knight commands the forces of the Void, with the aid of the Hollow Knight and the shades of the failed Vessels, to consume The Radiance. As the darkness from the Temple fades, Hornet awakens to find the chamber empty, except for the player Knight's broken and empty shell. Two additional endings were added with the Godmaster content update, in which the Knight can battle harder versions of all of the bosses in the game in a series of challenges set by a being called the Godseeker. If the Knight completes these challenges and battles the Absolute Radiance as the final boss, the darkness of the Void is summoned again to defeat her, but the Knight instead appears to transform into a massive Void creature and outright destroys the Absolute Radiance. The Godhome arena is consumed by darkness as the Godseeker begins oozing Void, which eventually erupts and destroys her as well before appearing to spread out into Hallownest. Hornet then is seen standing by the Temple as the tendrils of Infection turn black. A creature approaches her armed with a weapon and rattling chains, implied to be the Hollow Knight now free from its prison, and Hornet readies for battle. The fifth ending is unlocked if the Knight has given the Godseeker a Delicate Flower item before defeating the Absolute Radiance. The ending is identical to the fourth, but both the Godseeker and the Void vanish before the Void is able to spread like it did in the fourth ending. Hollow Knight was revealed on Kickstarter in November 2014 and reached its initial funding goal in December of the same year. The game reached a beta state in September 2015 and continued to achieve numerous stretch goals to add in more content after an engine switch from Stencyl to Unity. Some of the stretch goal content, such as the Colosseum this is due to of Fools and The Abyss, still made it into the game despite those goals not having been attained. The Nintendo Switch version of Hollow Knight was announced in January 2017 and released on 12 June 2018. Team Cherry originally planned to make their game available on the Wii U. Development of the Wii U version began in 2016, alongside the PC version, and it eventually shifted to Switch. The creators of Hollow Knight worked with another Australian developer, Shark Jump Studios, to speed up the porting process. Initially, Team Cherry planned the Switch version to arrive "not too long after the platform’s launch", subsequently they delayed it to early 2018. A release date was not announced until the Nintendo Direct presentation at Electronic Entertainment Expo 2018 on 12 June 2018, when it was unveiled the game would be available later that day via Nintendo eShop. In the same month, Team Cherry announced a free major content update to the game entitled "Hidden Dreams", which was released on 3 August 2017. The update includes two new optional boss encounters, two new songs in the soundtrack, a new fast-travel system, and a new Stag Station to discover. The content can be accessed at any point in the game, though it is advised to wait until the late game due to the difficulty. On 26 October 2017, Team Cherry launched the second free content update, entitled "The Grimm Troupe". This content pack adds new major quests, new boss fights, new charms, new enemies, and other content. The update also added support for Russian, Portuguese, and Japanese. On 31 January 2018, Team Cherry announced their third free content updated entitled "Gods and Glory". The expansion title was later changed to "Godmaster" due to trademark. This expansion unlocks new characters, boss fights, music, a new game mode as well as two new endings. "Godmaster" was released on 23 August 2018. On 20 April 2018, Team Cherry launched a new update to the game entitled "Lifeblood" after a public beta testing period which started from 24 March 2018. This update was not one of the 3 originally planned DLC updates for the game, and mainly focuses on enhancing technical aspects of the game. It brings about various optimizations, changes to the color palette, bug fixes, minor additions as well as a new boss fight. Team Cherry were interviewed by Kirk Hamilton on the August 30th, 2018 edition of Kotaku's Splitscreen podcast. The interview covered many aspects of the game's development, ranging from its game jam genesis to its influences. Among those influences were Faxanadu, Metroid, Zelda II, and Mega Man X. It was noted that Hallownest was in some ways the inverse of the world tree setting in Faxanadu. William Pellen stated that they wanted to replicate the sense of wonder and discovery of games from their childhood, such as Zelda II and Faxanadu, in which "[t]here could be any crazy secret or weird creature." Hollow Knight's initial release received "generally favorable" reviews and the Nintendo Switch version was met with "universal acclaim", according to review aggregator Metacritic. Jed Whitaker of Destructoid praised it as a "masterpiece of gaming ..., and certainly art worthy of being in a museum" and, on PC Gamer, Tom Marks called it a "new classic". Reviewers spoke highly of Hollow Knight's atmosphere, visuals, sound and music, noting the vastness of the game's world. Critics recognized the combat system as simple, unsurprising or nuanced; they praised its responsiveness, or "tightness", similarly to the movement system. On IGN, Tom Marks stated: "The combat in Hollow Knight is relatively straightforward, but starts out tricky ... It rewards patience and skill massively". In his review on PC Gamer, Marks praised the "brilliant" charm system: "What's so impressive about these charms is that I could never find a 'right' answer when equipping them. There were no wrong choices." NintendoWorldReport stated: "Charms offer a huge variety of upgrades ... Some charms ... were so essential that removing them felt like trading a part of myself for a better chance at an upcoming battle." Difficulty of Hollow Knight received attention from reviewers. Vikki Blake of Eurogamer called the game "ruthlessly tough, even occasionally unfair". For Nintendo World Report's Adam Abou-Nasr it also seemed unfair—he had "'so frustratingly hard that I cannot recommend this game' angrily scrawled in [his] notes"—but "it eventually clicked". Destructoid "never found any of the bosses to be unfair". Critics described Hollow Knight as challenging; Destructoid and Nintendo World Report reviewers felt a sense of accomplishment after difficult fights. Critics also made comparisons to Dark Souls, noting the mechanic of losing currency on death and having to defeat a Shade to regain it. Destructoid praised this feature, as well as the holding down of a button to heal, because "[t]hey circumvent a couple of issues games have always had, namely appropriate punishment for failing, and a risk-reward system". As of February 2019, Hollow Knight has sold over 2,800,000 copies. Hollow Knight had sold over 1,250,000 copies by July 2018. The game had sold over 500,000 copies by November 2017 and surpassed 1,000,000 in sales on PC platforms on 11 June 2018, one day before releasing on Nintendo Switch, where it had sold over 250,000 copies in the two weeks after its launch. The game was nominated for "Best PC Game" in Destructoid's Game of the Year Awards 2017, and for "Best Platformer" in IGN's Best of 2017 Awards. It won the award for "Best Platformer" in PC Gamer's 2017 Game of the Year Awards. ^ "Hollow Knight Mac Debut Delay". 22 February 2017. Retrieved 23 August 2017. ^ Team Cherry (19 November 2014). "Hollow Knight". Kickstarter. Retrieved 3 March 2017. ^ Team Cherry (14 February 2019). "'Hollow Knight: Silksong' Revealed!". Retrieved 11 March 2019. ^ Aaron Souppouris (13 February 2019). "'Silksong' is a full-blown sequel to 'Hollow Knight'". engadget. Retrieved 13 February 2019. ^ Team Cherry (7 July 2016). "Hollow Knight Info Sheet". Archived from the original on 18 May 2018. Retrieved 18 May 2018. ^ a b c d e f g h Marks, Tom (10 July 2017). "Hollow Knight review". PC Gamer. Retrieved 10 July 2017. ^ a b Walker, John (2 March 2017). "Hollow Knight feels too familiar, despite being a solid metroidvania". Rock, Paper, Shotgun. Archived from the original on 12 August 2017. Retrieved 18 May 2018. ^ a b c d e f g h i j k Whitaker, Jed (27 March 2017). "Review: Hollow Knight". Destructoid. Retrieved 27 March 2017. ^ a b c d e f Team Cherry (2017). Hollow Knight Game Manual. Team Cherry. ^ Horti, Samuel (5 August 2017). "Hollow Knight's free Hidden Dreams update out now". PC Gamer. Archived from the original on 21 October 2017. Retrieved 18 May 2018. ^ "Hollow Knight". Kickstarter. Retrieved 23 August 2017. ^ Cousins, Jon (21 January 2018). "Feature: Bugging Out With Hollow Knight's Team Cherry". Nintendo Life. Retrieved 26 June 2018. ^ Devore, Jordan (17 May 2017). "Hollow Knight now has a second team to help speed up the Switch port". Destructoid. Retrieved 26 June 2018. ^ Wales, Matt (14 November 2018). "Hollow Knight on Switch has been delayed until early next year". Eurogamer.net. Retrieved 26 June 2018. ^ Wales, Matt (12 June 2018). "Hollow Knight is out on Switch today". Eurogamer.net. Retrieved 26 June 2018. ^ "Hollow Knight | IndieBox". www.theindiebox.com. Retrieved 3 June 2017. ^ "Free Content Pack 01: Hidden Dreams coming 3 August :: Hollow Knight General Discussions". steamcommunity.com. Retrieved 23 August 2017. ^ "The Grimm Troupe Descends! Backer Rewards! TGS! Cosplay! More!". Team Cherry. 14 September 2017. Retrieved 26 October 2017. ^ "Hollow Knight: Gods & Glory is now Godmaster!". Team Cherry. 15 August 2018. Retrieved 9 September 2018. ^ "GODS & GLORY REVEALED! CHRISTMAS WRAP! SWITCHY-STUFF!". Team Cherry. 31 January 2018. Retrieved 16 February 2018. ^ "Hollow Knight: Lifeblood now on public beta! Short Switch Update!". Team Cherry. 24 March 2018. Retrieved 31 May 2018. ^ "Hollow Knight: Lifeblood has launched!". Team Cherry. 20 April 2018. Retrieved 31 May 2018. ^ a b "Hollow Knight for PC Reviews". Metacritic. Retrieved 27 June 2017. ^ a b "Hollow Knight for Nintendo Switch Reviews". Metacritic. Retrieved June 27, 2018. ^ a b c Blake, Vikki (28 June 2018). "Hollow Knight review – a slick, stylish, and super tough Metroidvania". Eurogamer.net. Retrieved 28 June 2018. ^ a b c d Marks, Tom (21 June 2018). "Hollow Knight Review". IGN. Retrieved 22 June 2018. ^ a b c d Mundy, Jon (19 June 2018). "Review: Hollow Knight (Switch eShop)". Nintendo Life. Retrieved 22 June 2018. ^ a b c d e Abou-Nasr, Adam (22 June 2018). "Hollow Knight Review – Review". Nintendo World Report. Retrieved 24 June 2018. ^ a b c d e Forrest, Tavish (15 May 2017). "Review: Hollow Knight". PC PowerPlay Magazine. Retrieved 23 June 2018. ^ a b Cook, Adam (27 June 2018). "Hollow Knight review". VideoGamer.com. Retrieved 27 June 2018. ^ Gibson, Ari (14 February 2019) Team Cherry "Hollow Knight: Silksong Revealed! ^ a b Walker, Alex (5 July 2018). "Hollow Knight Has Sold More Than 1 Million Copies On PC". Kotaku Australia. Retrieved 23 July 2018. ^ Walker, Alex (10 November 2017). "Hollow Knight Has Sold Over 500,000 Copies". Kotaku. Retrieved 10 November 2017. ^ Stevens, Colin (29 June 2018). "Hollow Knight Sold over 250,000 Copies on Switch in Its First Two Weeks". IGN. Retrieved 29 June 2018. ^ Carter, Chris (12 December 2017). "Nominees for Destructoid's Best PC Game of 2017". Destructoid. Retrieved 3 January 2018. ^ "Best of 2017 Awards: Best Platformer". IGN. 20 December 2017. Retrieved 3 January 2018. ^ PC Gamer staff (17 December 2017). "Best Platformer 2017: Hollow Knight". PC Gamer. Retrieved 31 December 2017. ^ Aviles, Estevan (31 January 2017). "Gamer's Voice Nominees Revealed for SXSW Gaming 2017". SXSW. Retrieved 16 March 2018. ^ Makuch, Eddie (8 December 2017). "The Game Awards 2017 Winners Headlined By Zelda: Breath Of The Wild's Game Of The Year". GameSpot. Retrieved 31 December 2017. ^ Gamasutra staff (5 January 2018). "Breath of the Wild & Horizon Zero Dawn lead GDC 2018 Choice Awards nominees!". Gamasutra. Retrieved 8 January 2018. ^ Makuch, Eddie (22 March 2018). "Legend Of Zelda: Breath Of The Wild Wins Another Game Of The Year Award". GameSpot. Retrieved 22 March 2018. ^ deAlessandri, Marie (15 March 2018). "Hellblade: Senua's Sacrifice at forefront of BAFTA Games Awards nominations". MCV. Retrieved 16 March 2018. ^ Makedonski, Brett (12 April 2018). "BAFTA names What Remains of Edith Finch its best game of 2017". Destructoid. Retrieved 13 April 2018. ^ Hoggins, Tom (24 September 2018). "Golden Joysticks 2018 nominees announced, voting open now". The Daily Telegraph. Retrieved 7 October 2018. ^ Sheridan, Connor (16 November 2018). "Golden Joystick Awards 2018 winners: God of War wins big but Fortnite gets Victory Royale". GamesRadar+. Retrieved 18 November 2018. ^ Grixti, Shannon (20 December 2018). "All the winners from the Australian Games Awards". Press-Start. Retrieved 20 December 2018. This page was last edited on 25 April 2019, at 15:21 (UTC).